Milford Sound is commonly referred to as the 8th wonder of the world. Discover the amazing scenery during our truly unique experiences. Let us take you on a journey on board the Milford Haven or immerse yourself at sea level on a kayak adventure surrounded by one of Nature’s best creations. We aim to make your experience as memorable and personal as possible. Go further than the average tourist and Go Beyond with us. Milford Sound is commonly referred to as the 8th wonder of the world. To cruise Milford Sound is one of New Zealand’s truly unique experiences. You will find Milford Sound quietly tucked away in the South Island of New Zealand. Rich in nature and diverse culture, some say there’s nowhere quite like it on earth & we agree. Go Orange proudly offers you the whole cruise experience, inviting you to join us in our picture perfect playground. You will find mighty mountains, waterfalls cascading from them and the iconic Mitre Peak. We will transport you to Milford Sound from Queenstown or Te Anau on board one of our brand new glass roofed coaches, equipped with USB ports, WIFI and comfortable seats. We pride ourselves in our approach to cruising, allowing you and your fellow travellers the time to immerse fully in the jaw dropping surrounds. You can chose to explore the boat without haste as you have a full two hours out on the water. We aim to get you as close to the mountains that rise from the ocean as possible, carving the epic fiord we see today. The vessel will hug the outside of Milford Sound as the mountains tower above. You may also get the chance to make friends with some of our local residents as Milford Sound is home to an array of beautiful wildlife. Our boat is comfortable, modern and a fresh take on how cruising should be. We want you to relax enjoy the breathtakingly beautiful views from the comfort of our vessel. Milford Sound is the most popular and accessible of all the fiords. Milford Sound is 16 kilometres in length and the mountains reach an impressive 1200 meters in height. This famous fiord is a World Heritage Area and home to plenty of wildlife and native flowers and fauna. The average annual rainfall is 268 inches, which presents plenty of temporary waterfalls as well as pumping the residents, Stirling and Lady Bowen Falls. Milford Sound is breathtaking on a sunny day and beautifully moody in the rain, the weather is pretty unpredictable so pack accordingly. To explore this magnificent area in a more intimate way and at sea level, our sea kayaking adventures are perfect. 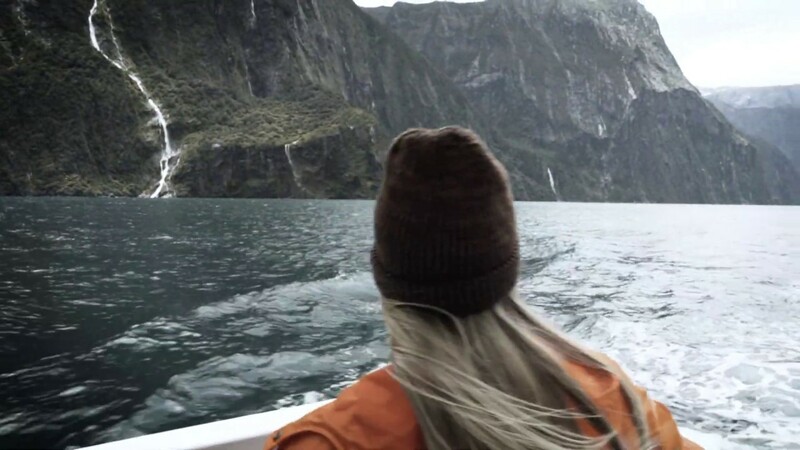 The journey down into Milford Sound is one of the most awe – inspiring you will ever take. We offer a comfortable ride while transporting you into the wonders of Fiordland National Park. Our drivers are highly skilled, educational and passionate about the land. They will expertly guide you to the vessel for the cruise experience. Milford Sound is a 5-6-hour drive, one way, from Queenstown and a 3-hour drive from Te Anau. The Milford Road, one of the world’s finest alpine roads can experience all four seasons in one day. You are welcome to drive yourself or jump on one of our brand-new coaches. Our drivers know all the right places to stop for photos and short nature walks. Pack your rain jackets kids, you are about to enter one of the wettest places on Earth, getting more rainfall than the Amazon Rainforest. It rains for around 200 days a year, so don’t be disheartened if it rains on your visit. The temperature in Milford Sound varies depending on the season. Average Summer highs around 19C and down to 8C in the Winter. Please pack appropriate clothing for your visit so you can enjoy the surrounds no matter the weather. The Milford Road is home to plenty of our Native birds, the Kea making regular appearances to entertain the masses. These cheeky birds are brave and will happily post for photos, watch your belongings however, they are known to be little pickpockets. Milford Sound is also home to pods of Dolphins, Penguins and a Fur Seal colony that are best viewed from the cruise as we past Seal Rock. Although we can’t guarantee wildlife sightings, we will keep our eyes and ears open for the local residents and let you know if they come to visit. Milford Sound will leave you speechless. This spectacular area of Fiordland National Park is home to rich geological past. Blending years and years of ice ages, glaciers, tectonic activity resulting in the spectacle you view today. Paired with rich Maori culture and history about its discovery, Milford Sound will have you under its spell pretty quickly. Believed to have been discovered by the Maori’s over 1000 years ago, receiving its Maori name Piopiotahi after the legend of a single Piopio bird which flew here to mourn the death of its partner. In 1812 Captain John Grono named it Milford Haven (also the name of our boat) after his homeland in Wales. Captain John Stokes later changed the name to Milford Sound. Race forward to 1954 and the Homer Tunnel was developed to provide road access to the fiord, an awesome part of driving down to Milford Sound is passing through the mountains, blown out to carve the tunnel. It is undeniable that Milford Sound contains some of the country’s best scenery. Can we drive from Te Anau to Milford Sound? Yes, the drive is around three hours and one of the best drives in the world. Make sure you stop at the Mirror lakes, the Homer Tunnel and Eglington Valley for some awesome photos. Is there somewhere to park in Milford Sound? There is a public car park at the Milford Sound Terminal. This is a ten-minute nature walk from the terminal, be sure to allow that time as you walk to your cruise. Can we stay in Milford Sound? There is the Milford Sound Lodge accommodation. Here you can pick from cabin rooms, lodge rooms and campervan parks. The road to Milford Sound has a few campsites too, if you are a self-contained vehicle. There is no freedom camping in Fiordland National Park. Accommodation options are also available in Te Anau. Is there anything else to do in Milford Sound apart from cruise? You can take short nature walks around the terminal or opt for an epic multi day adventure on the Routeburn or Milford Track. How about kayaking Milford Sound? Go Orange offer day kayaking adventures, exploring deeper into the fiord and surrounds. If I self-drive to Milford is there anything to do around the terminal? You can now pay $10 to get a small boat across the harbour to Lady Bowen Falls for a short nature walk and to be right under one of Milford Sound’s resident waterfalls. There are also short nature walks around the terminal and a wooden rope swing you can find to snap some shots for the gram. Does it always rain in Milford Sound? No, but it is the wettest place on Earth so pack accordingly. Don’t be disheartened if it rains, the waterfalls are more powerful, and it still looks pretty epic. From $209 Shotover River Rafting with grade 3-5 whitewater action. It's an action packed adventure in Queenstown. A New Zealand must do experience.